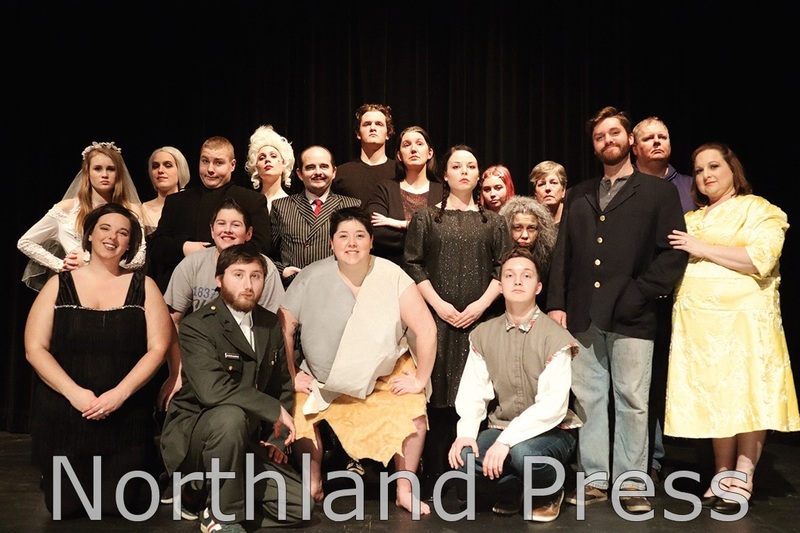 Pequot Lakes Community Theatre will present The Addams Family, A New Musical on February 22, 23, and March 1, at 7:30 p.m. Also, February 24, March 2, and 3, at 2 p.m. in the Pequot Lakes High School auditorium. 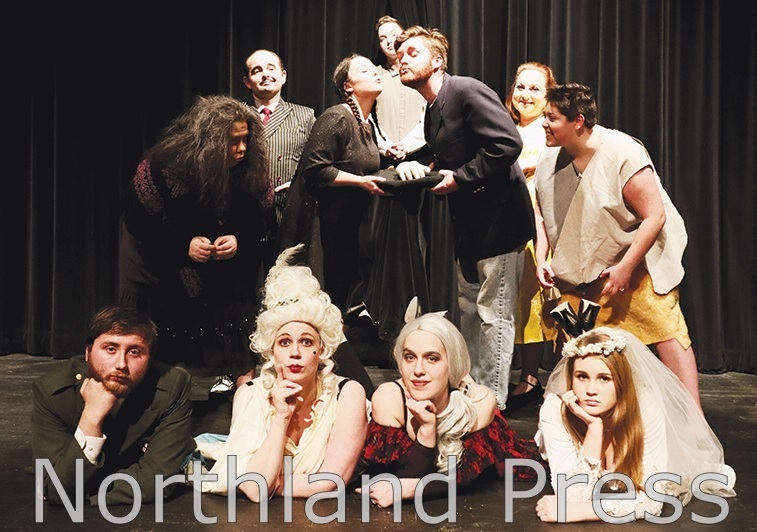 Meet the Artists of the Addams Exhibit February 22nd before the show and during intermission. Talkback sessions are scheduled after the performances on February 24th and March 2nd. As the curtain rises, the last dead leaf of autumn falls from the Family Tree, and all is right with the morbid, macabre world of Gomez (Ben Gordon, Pine River), Morticia (Kate Davis, Pequot Lakes), Fester (Dalton Ebnet, Pequot Lakes), Grandma (Jen Anderson, Pine River), Wednesday (Nicole Rothleutner, Pequot Lakes), Pugsley (Josh Anderson, Brainerd) and Lurch (Sam Moreland, Breezy Point). They’ve gathered – where else? – in the family graveyard, to celebrate life and death in a yearly ritual to connect with their past and ensure their future. They seem at peace, not just with each other and their inimitable, unchanging Addamsness, but with their dead ancestors, too (Phylipe Bell, Bobbi Cruikshank, River Curtis, Lola Eastwood, Brianna Engels, Gracin Johnson, Susan Langins, Rachel Martin, Heather Pearson, and Nikoa Perkins) – who emerge from their graves on this night each year to join in this celebration of continuity. But, at the end of the ritual, Fester blocks the ancestors’ return to their graves. Those unchanging Addams family values are about to be tested. Fester enlists their help to set things right, just in case a new family secret goes terribly wrong. What’s the secret? Wednesday Addams, that irresistible bundle of malice, has grown up and found love. So what’s the problem? The young man, Lucas Beineke (Eddie Binda, Merrified), is from Ohio, and his parents (Andrea and Mike Anderson, Brainerd), are coming to dinner to meet the family. Classic characters, Cousin Itt (Keenen Bleichner, Brainerd) and Thing (Daisy Davis, Pequot Lakes), will make appearances too! Book by MARSHALL BRICKMAN and RICK ELICE Music and Lyrics by ANDREW LIPPA Based on Characters Created by Charles Addams. Originally produced on Broadway by Stuart Oken, Roy Furman, Michael Leavitt, Five Cent Productions, Stephen Schuler, Decca Theatricals, Scott M. Delman, Stuart Ditsky, Terry Allen Kramer, Stephanie P. McClelland, James L. Nederlander, Eva Price, Jam Theatricals/Mary LuRoffe, Pittsburgh CLO/Gutterman-Swinsky, Vivek Tiwary/Gary Kaplan, The Weinstein Company/Clarence, LLC, Adam Zotovich/Tribe Theatricals By Special Arrangement with Elephant Eye Theatrical. Tickets can be reserved by calling (218) 568-9200 or purchase online at www.glapa.org.